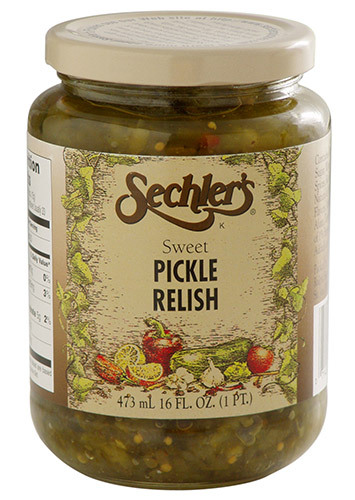 16 ounce Sweet Pickle Relish is our most famous and traditional pickle relish. It is made from sweetened pickles. From Anonymous of Arlington Heights, Illinois on 9/2/2018 . Been getting this for years from my butcher shop Thuringer Prime Meats in Arlington Heights. Goes great on homemade beef/pork hot dogs. You don’t need to add celery salt because yo can taste the celery seed in the relish. Relish doesn’t have high sodium which is god for your blood pressure too. From Anonymous of Columbia City, Indiana on 4/22/2018 . Best sweet pickle ever and why can’t we buy it in any grocery stores. Groceries get with the program!!! From Barbara Stubbs of Mount Pleasant, South Carolina on 12/19/2017 . From Susanne of Bruce, Wisconsin on 10/31/2017 . Excellent products. I make baskets for friends for Xmas and I include a jar of Sechler’s Sweet Relish. From Shirley Warner of Leominster, Massachusetts on 3/3/2017 . I have loved this relish for years. Being from Indiana and moving around the US in the Army and settling in Massachusetts, we had the opportunity of visiting family in Indiana and stocking up when we were there. We have no family left so mail order was the best we could do!